Safety stock is an absolute necessity to keep your reputation as a reliable supplier, but it's also important to minimize the cost of your safety stock. Determining the right amount of safety stock is difficult so how should you go about it? This is one of the questions we answered in our webinar on safety stock. This webinar will be on automation and how you can automate processes to optimize your inventory – by reducing the time spent on your calculations, improving your customer service level, and reducing your inventory levels. 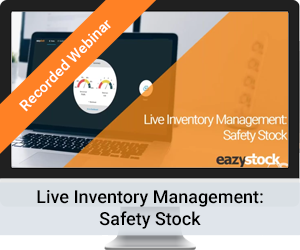 Watch our webinar on automation for inventory management to learn more! © 2019 Syncron International AB and/or its affiliates. All rights reserved.